In general the material class under investigations - Heusler compounds with X2YZ with L21 and XYZ with C1b structure type – show the same broad variety of properties comparable to the perovskites, including topological insulators, Kondo behaviour, non-centrosymmetric superconductivity and conventional, tunable magnetic properties, non-collinear magnetism, semiconductivity, magnetoresistance effects, Li-ion-conductivity and other physical properties. Different to the perovskites only a few groups mainly in Germany and Japan are working on this class of materials. However many companies such as Hitachi, IBM, Toshiba, Toyota etc. have research activities based on this material class. Prof. Paul Canfield's, Ames Lab, comment: "The Kavli Symposium, "From Unit Cell to Biological Cell" at the 2019 APS March Meeting was a huge success! The five invited talks merged seamlessly into an example of the richness and diversity of the physics of materials across vast length scales. 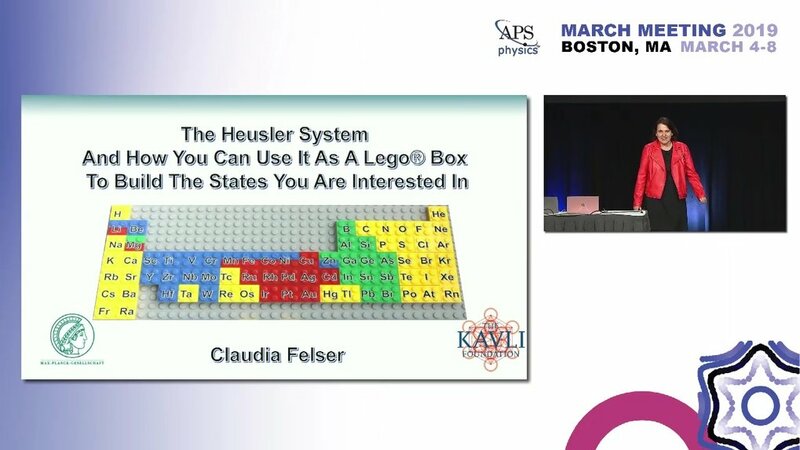 The first lecture, by Professor Claudia Felser, combined legos, donuts, and insightful physics and chemistry to set the perfect tone for the subsequent four talks."